Pie season continues apace! 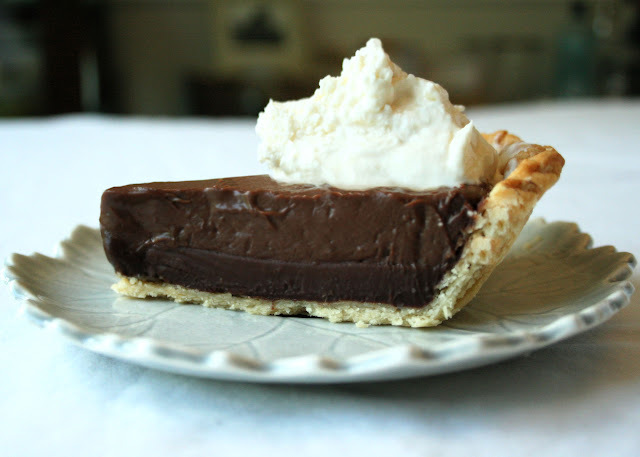 Today is chocolate cream pie, which might be my very favorite thing to eat. I mentioned in the key lime post that this pie is complicated - and I think I misspoke. It's actually very simple, but with a few more steps than the ridiculously-easy key lime. Won't you join me on this delightful trek toward hyperglycemia? It's worth it. This recipe, culled from several, was already very good - and already rich. It has a fudgy, pudding-like filling (as opposed to the butter-rich filling of a French silk pie). But as I see it, there are few treats that can't benefit from a layer of chocolate ganache - so I added one. If you, on the other hand, aim to make this a little less rich (and this pie is very rich), leave out the ganache, and go easy on the whipped cream. You may also omit a tad of sugar from the filling if you're less inclined to sweetness. Here is where I make an impassioned plea for homemade pie crust. It's really not that hard, and honestly, it's worth it. But any good pie will still be delicious with a store-bought crust. They were, in fact, my grandmama's secret to baking. Place chopped semisweet chocolate in a medium bowl. In a microwave or on the stovetop, heat cream just until boiling, then pour over the chopped chocolate. Swirl to coat, then let sit for about 3 minutes. Whisk the mixture, concentrating on the center until the mixture starts to combine, then work your way out. Pour into prepared crust. Refrigerate for an hour or so. In a medium saucepan, combine sugar, flour, cornstarch, salt, and milk. In a medium bowl, lightly whisk the egg yolks. Heat the milk mixture to a simmer over medium heat, whisking often. When mixture has reached a simmer, pour about 1/4 cup of the milk mixture into the egg yolks, whisking the yolks as you pour. Do this three more times. When you have incorporated about 1 cup of liquid into the egg yolks, pour yolk mixture into the saucepan, and continue whisking the mixture. Stir the mixture constantly over medium heat until it thickens and reaches a boil, then stir over the heat for one more minute. Remove from heat, and stir in unsweetened chocolate, butter, vanilla, and amaretto or coffee. Stir until melted. Pour over cooled ganache. Place plastic wrap directly onto the filling to keep a skin from forming. Before serving, beat cream until slightly thick, then add sugar and vanilla. Whip to stiff peaks. Spoon a dollop on top of pie slices. This recipe makes enough for two single-crust pies, or one double-crust pie. Unbaked dough may be frozen - wrap tightly in plastic and seal in a freezer bag. In a food processor, combine flour, salt, sugar, butter, and lard or shortening. Pulse until mixture resembles coarse meal, with some lumps about the size of peas. Quickly, with the machine running, pour in cold water in a steady stream. Mixture should just hold together. Add up to 1/2 cup of water if necessary. Shape dough into two equally-sized disks. Wrap each in plastic, and refrigerate at least one hours and up to two days. If you're blind-baking a crust for a recipe like the chocolate cream pie, roll one disk out into a circle about 11" wide, and about 1/8" thick. Fold the dough over the rolling pin and transfer to a 9" pie plate. Trim the overhang to 1", fold the overhang under, and crimp decoratively. Refrigerate for 30 minutes. Preheat the oven to 375F. Bake 30 to 35 minutes in the preheated oven. Cool before using. I'm making this and your key lime pie for the 4th of July. What says America like a couple of yummy pies? It's what the founding fathers intended, Claire. You're welcome, Ellie! I hope everyone likes it!